The Canadian Veterinary Association and the SPCA along with many international animal welfare groups, oppose the Islamic, Halal slaughter of animals. They are trying to have it banned since it causes unnecessary fear and pain to the animal. According to animal welfare experts the halal slaughter method is inhumane causing unnecessary pain and fear to the animal at their death, yet it is being served in our Canadian Universities, often exclusively, to accommodate about 3.25% of the population. It is also common sense that if an animal is bled out slowly, particularly cows who have longer times in which they are conscious, it causes fear and pain in the animal. However, according to Sharia Law this is exactly what the animal must suffer. The animal must be alive and conscious when it slowly bleeds to death from its throat being cut, and an Islamic prayer is said over the animal. Live animal slaughter is a prohibited practice in Canadian meat processing plants where animals are stunned and rendered unconscious before they are slaughtered so that they do die an agonizing death of bleeding out slowly. 2. The religious freedom for the 97% of Non-Muslim Canadians who are unaware they are eating Halal meat, and whose beliefs may be antithetical to Islam. 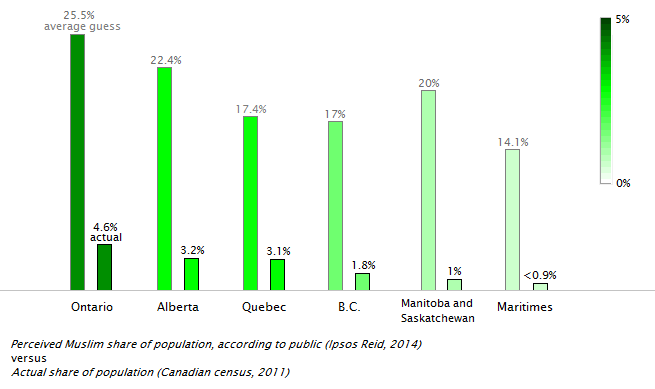 According to Stats Can, Muslims make up approximately 3.25% of Canada’s population. Of the 3.25%, many Muslims do not practice this optional ritual of slaughtering animals alive. There is no reason to subject the vast majority of Canadians to the slaughter of animals that have been treated inhumanely; and/or those with religious beliefs antithetical to Islam. Many are claiming that because Halal is a Sharia Law ritual, it is an inroad of Sharia Law into our Canadian democracy; and, the profits of Halal slaughtered animals have been linked to funding terrorism. Here are some of the Universities who state they serve Halal chicken and/or beef for their food services. The manager for Food Services advised that there are three locations on the UBC campus serving Halal beef and chicken. The chicken, lamb, and beef are all Halal with the exception that the frozen chicken and roast beef are not. All the burgers are Halal. When asked if the other 97% of students who are non -Islamic are made aware that they are eating Halal slaughtered meat, she said it does have the Islamic crescent moon indicating it is Halal on the menu. She said that the other 97% of students can make a request for non-Halal meat, but it would be a special order. She also said that the UBC gets many requests wanting assurance that Halal meat be served, and that the proper Halal ritual has been followed (live slaughter, Islamic prayer). This curious UBC would receive such a large number of calls since Muslims are only 3.25% of our Canadian population, and of that certainly not all Muslims practice this Sharia Law. 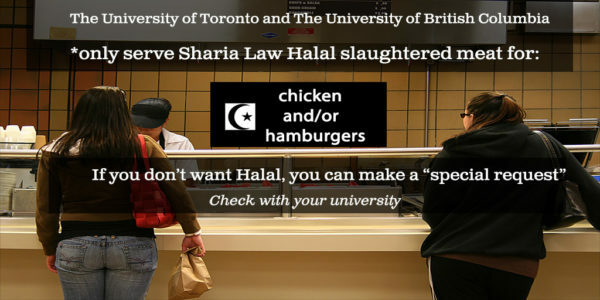 Halal meat at the University of Toronto has been slaughtered according to the Islamic method using the Zabiha process which requires that the name of Allah is pronounced at the time of slaughtering, that the animal is facing Mecca, and that a quick movement of a sharp blade severs the veins and arteries of the neck to permit the drainage of blood and minimize suffering for the animal. The Zabiha process improves the taste, shelf-life and healthiness of meat…. All chicken prepared and sold in our Food Services locations is halal. Halal appears to be a different situation at McGill who adopted a proportionate accomodation to the small percentage of Muslims in Canada. Though the Halal meat processing company PM Trudeau speaks on behalf of, somehow is tied to McGill. This entry was posted in Halal Islamic Sharia Law, Think Over News and tagged canada, halal meat, islam, schools, sharia law, universities.